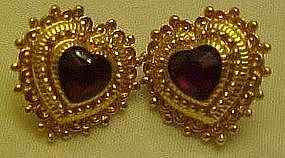 Pretty goldtone earrings measure about 3/4" x 3/4" and have a red rhinestone center. These are for pierced ears and have a post back. unsigned but are nicely made. Very nice condition.